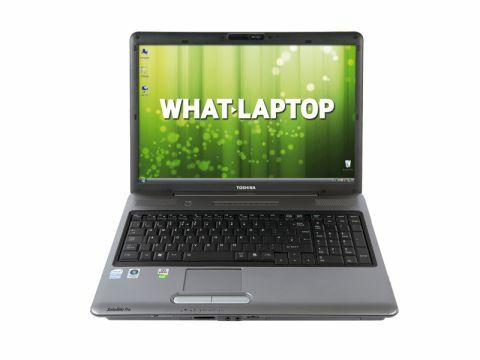 While Toshiba's Satellite Pro P300-1FP (£410 inc. VAT) is not the best laptop compared to some competition, it is the more affordable and provides enough power and usability to be a great choice for smaller budgets. At 3.3kg, the chassis is slightly heavier than many similar laptops. The bulky design makes it appear far larger, however, so it is best suited to use around the home. This limited mobility is further hampered by the low 118-minute battery life, worse than most laptops in the price range. The plastics used have a robust matt finish, which makes them more resilient to scratches than other glossy units. A large fan is located on the left side and, while unsightly, it keeps the laptop cool during prolonged use. The large 17-inch screen suits multitasking and entertainment use, but image quality fails to impress, due to poor brightness, colour and contrast. Images are well-defined, however, thanks to the sharp 1440 x 900-pixel resolution. Due to the large chassis, there is an equally large keyboard. Usability is excellent and all keys respond well. There is a slight clicking sound when typing, but not enough to annoy. The large recessed touchpad and huge mouse buttons are also pleasingly responsive at all times. Four USB ports let you connect external peripherals and a FireWire port is also included. This data transfer technology is arguably faster and more stable than USB, so is ideal for transferring video from a camcorder. This laptop also fails to feature a digital HDMI port, so you can only connect external analogue screens. As with the MSI VR705, Toshiba has used a dual-core Intel Pentium processor. Despite using less memory than the MSI, it provides better performance and it is ideal for fairly intensive use in the home or office. Conversely, graphics performance is quite low. Rather than using a dedicated graphics card, Toshiba has used an integrated Intel chip. Basic photo editing is still possible, but this isn't the best choice for video editing, and gaming is out of the question. Storage space is also disappointing, but to a certain extent this is to be expected at such a low price. The 160GB hard drive will suit a single user, but will quickly be filled by a family. The dual-layer DVD rewriter is a bonus at this price, however, so you can easily back up your data to CD and DVD. While the Satellite Pro P300-1FP is a great value laptop at this price point, its more expensive rivals inevitably better it in key areas. However, thanks to its stronger performance and a price tag of up to £100 less than some comparable laptops, you may find the trade off to be one worth making.